Although he is not in the running for any major awards this year, Jayson Werth just may take home the award for 2014 MLB Giveaway MVP. The Washington Nationals' outfielder was first treated to a limited bearded bobblehead, and now he has his own garden gnome. 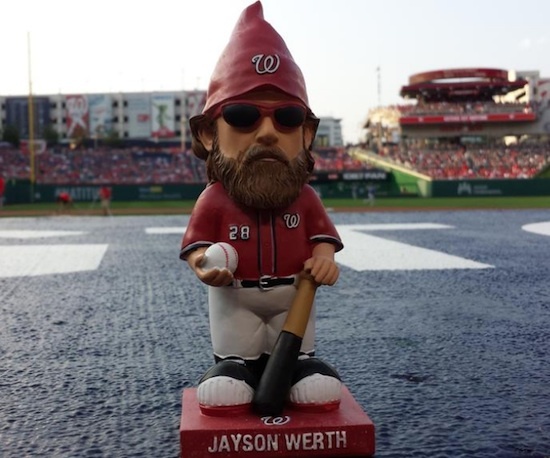 Part of a giveaway by the Nationals on August 5, 2014, Jayson Werth garden gnomes immediately sprung up on eBay and early prices have taken off. The athletic garden gnome checks in just smaller than the average bobblehead and seamlessly transitions the 6'5" Werth into a Hobbit-esque figure mostly due to his flowing beard and hair. The garden gnomes, complete with sunglasses, started selling for around $40 soon after they were distributed, but prices have now moved past $100, with some peaking at about $125. Despite taking place during a Tuesday-night matchup against the Mets, the giveaway game was a near-sellout, with over 40,000 in attendance largely because of gnome-mania. The line for the garden gnomes began at 2:10 PM for a 7:05 PM game and all 25,000 Jayson Werth figures were gone by 6:15 PM. The excitement surrounding the gnomes even caused congestion problems on the DC Metro. Giveaways have become a normal occurrence for MLB teams, especially bobbleheads, and unique items can produce a tremendous response from fans.